At TheHealthyWeighOut, one of our dreams is to cultivate a community of like-bodied, like-minded people who provide non-judgmental support for each other throughout their journey of change. We are proud to say that this dream is coming true! Community events: Open to the public, these community events cover a range of issues related to emotional and binge eating. From awareness walks to informative lectures to group gatherings, these events provide a great opportunity for people to come together to learn, meet others who “get” it, and become a part of an emotionally-safe, body-safe community. All are welcome to attend these informative and helpful events; if you might like to attend a future event, please follow our Meetup group (it’s free to sign up!) to stay up-to-date on upcoming events. Private Facebook Group: This bonus is offered to all people who have completed our 3-part workshop series. It’s a wonderfully helpful resource for our participants and alum to stay in touch with other people who “get” it. The group is very active, sharing inspirational quotes and photos, seeking and giving support, and asking questions about various issues related to emotional and binge eating. Interpersonal Therapy Process Group: This aftercare service is available to all people who have completed our 3-part workshop series. 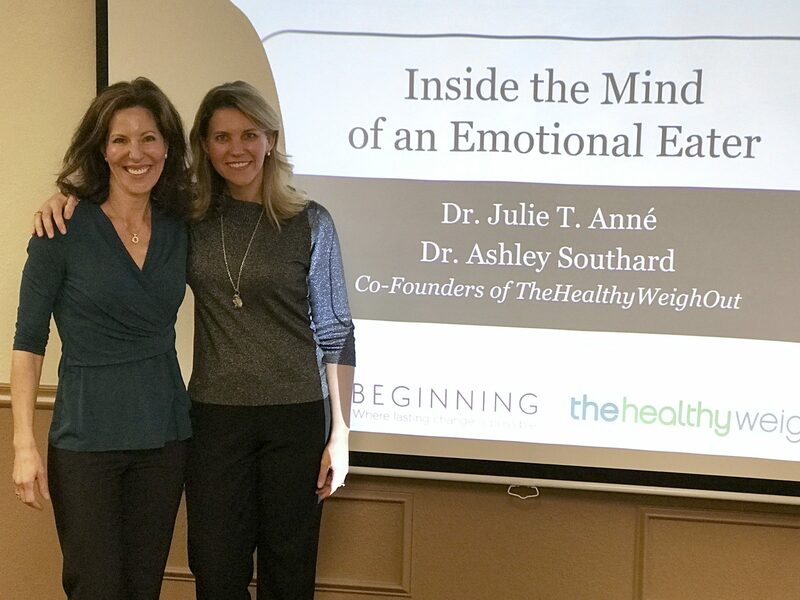 With a focus on helping people resolve the underlying issues that drive them to overeat, this therapeutic group (hosted at our parent company’s center, A New Beginning) is a powerful and effective component to our participants’ transformation out of emotional and binge eating. Facilitated by the program’s Co-Founder, Dr. Julie T. Anné, this group meets weekly; participants are invited to be a part of the group for as long as they want following successful completion of our program. Recently we hosted a HWO Program Alum Reunion, so that members of our like-minded, like-bodied community could meet each other and form new friendships. Here is a short video giving you a peak into the meaningful words exchanged with each other at this event. We hope the words of our alum capture the essence of how our no-diet approach to treating emotional and binge eating is transforming lives every day! At TheHealthyWeighOut, we are very proud to be creating an atmosphere of hope, inspiration, and support for people who so often struggle alone. We hope to see you at an upcoming event, or perhaps, in our office for one of our many services offered through our center. For more information regarding upcoming events and services, please call 480-941-6999.